I almost never have any issues or confrontations about my bare feet within the community that I live. But a few years ago, a rare exception to this did occur at a local restaurant. Will this myth never die? I was indeed barefoot, as I always am everywhere I go, and as I’ve been in that particular restaurant many times over the years without a problem from anyone. I was quick to correct her by stating that no such thing would happen, and showed her a letter I have from the county health department as well as one from the state health department that confirms that there are NO state or local health department rules that address a customer’s attire. I am completely aware of the fact that any private business can set up its own dress code if it wants to, but that’s not the issue here. 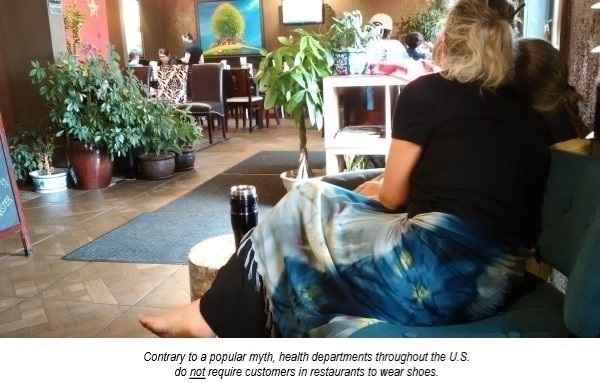 I’m continually amazed at the number of people who still believe the myth that there are some kind of health department rules or regulations or some kind of other law that requires customers or patrons to wear footwear in a place that sells food or some other business. Almost without exception, no such laws or regulations exist – not in this county, this state, or any other state in the United States. If you think about it logically, why would there be? 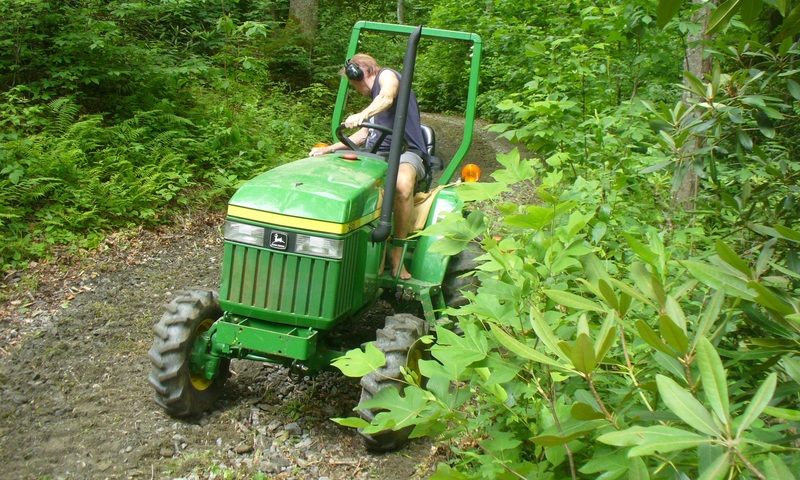 Bare feet do not in any way affect environmental health or anyone’s individual health. Bare feet touch only the surfaces on which they walk, just like shoes, nothing else. How could that possibly cause some kind of health concern? It is bare hands, not bare feet, that may pose or encounter health risks as they come in contact with door handles, food, utensils, table tops, products on shelves, money, other people, etc., in a store or restaurant. There is no reasonable, logical, medical or scientific evidence whatsoever that shows bare feet in a store or restaurant as posing any sort of health risk to either the person barefoot or other people. As someone who has made the free-will decision many years ago to never wear shoes, I have done extensive research into all the legal, health, medical, physiological, and safety aspects of my decision. It is highly unlikely that anyone – that is, anyone who is not a full-time barefooter as I am – knows more about going barefoot than I do, and certainly not some restaurant employee who obviously even lacks a rudimentary knowledge of basic health code requirements. What I choose to wear or not wear on my feet is my own concern and should be of no concern whatsoever to any other person. The vast, vast majority of the good people of the county and community in which I live have always treated me with the utmost dignity and respect regardless of my attire or choice of no footwear. So when somebody not only has the gall to make some comment on how I choose to dress, but tries to justify that comment with some phony “law” they’ve only heard about and have no real knowledge of, it’s very disappointing, to say the least. Copies of current letters from the health departments and/or agriculture departments of all 50 states are posted on the Society for Barefoot Living‘s website, on the “Health Codes & OSHA” page, all of which confirm that they do not regulate any customer’s attire. I wonder if this Health Department myth is USA-specific? I’ve never encountered it in Russia. What about other countries? It is pretty much USA-specific as far as I can tell. Though I’ve heard of some isolated cases of references to “Health & Safety” in the U.K. as a justification for barefoot discrimination.